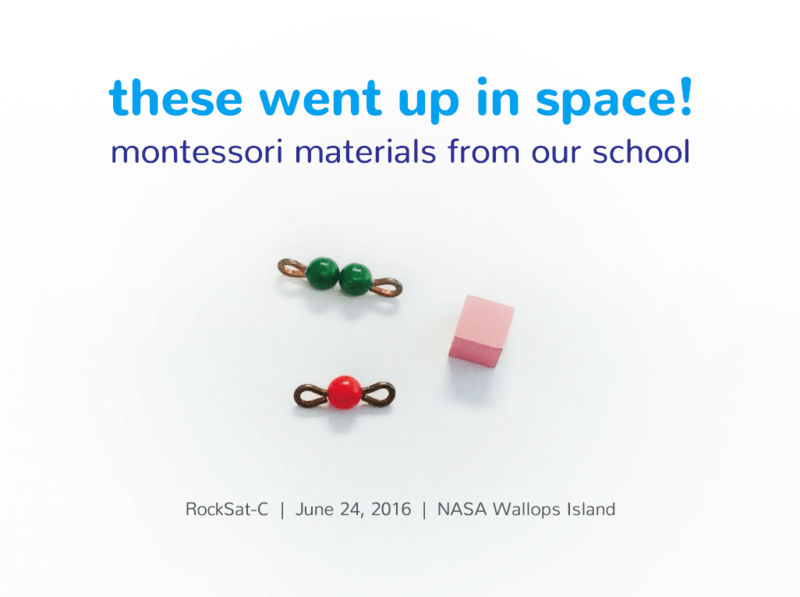 Chesapeake Montessori School had the special privilege of participating in a NASA Wallops Island rocket launch this past summer. Some of our smallest materials (the smallest pink tower cube, representing Children’s House and Toddler, the one, and two beads from the bead chains, representing lower and upper elementary) were carried aboard the rocket in a small plastic cube secured to one of the main structural pylons on the lower deck of ODU’s payload. This cube was held in place with several winds of electrical tape and steel wire to withstand the launch acceleration in excess of 10 G (10 times the force of gravity). At T+0 seconds (6 am on the 24th of June, 2016), the rocket received the launch command from the automated sequencer on the ground. It was lofted into the upper atmosphere by several thousand pounds of thrust at a speed exceeding several times the speed of sound, crossing the Karman line into space, 100 kilometers up, just 2 minutes after leaving the launch rail. It spent approximately 120 seconds in space proper where ODU student experiments could be carried out above the Earth’s atmosphere, before plunging back down, decelerating via flat spin, like a pinwheel. At around 10 minutes, the rocket automatically deployed its first parachutes to slow the descent and splash down gently into the Atlantic Ocean, around 70 miles East South East of Wallops Island, Virginia.